TLDR; Go to the Process block. Ever since I first got introduced to Powershell, I have always tried to come up with ways to include, facilitate and apply it to my my everyday tasks. But for me, using Powershell in combination with SCCM has never been the ultimate combination, the built in cmdlets doesn’t always do it for me, and the gui is most of the times easier to understand. So when I got a request to simplify removal of distributed content on all distribution points or all distribution point groups, it left me with two options. To create a script what did the desired job, or to create a function that would cover all the possible scenarios. So I thought; “Why don’t I take these matters in my own hands and create what I actually desire?” That is why I created a script that helped to find the content wanted for removal, and to have the distributed content removed from every Distribution Point or Distribution Point Group. And to do these steps for every distribution point would just take forever. Of course, using one Distribution Point Group would of course be more effective and the ideal way to go, but you might have distributed it to multiple Distribution Point Groups? That is something that already has been thought of, and that is why this script is created. Even if you have distributed it to some distribution points, and some distribution point groups, it will all be removed. But how does it work? In this demonstration, I will have two packages distributed with similar names. One of them will be sent to a Distribution Point Group, and the other one to 2 Distribution Points. And I would like to have both of them removed from whatever they have been distributed to. 2. Run the script with the required parameters. As shown in the picture below, I searched for ‘TestCM’, but it resulted in showing multiple results. The search is done with wildcard, so everything similar to the stated PackageName will be found. All the parameters have a more detailed description in the script below. The parameter -CMSiteCode is mandatory and must be specified. If not, it will check if the content is distributed to each Distribution Point as a Package. At the beginning of the script, the content is validated as distributed. If not, it will not be shown. These four steps above covers all distributed scenarios. 5. When finished, we can see that the Distributed content successfully has been removed. Please read the comment based help to get a better understanding of what is actually running in the background. Instead of removing content from one distribution point one at the time is this function created to serve a multi purpose removing distributed content. If you know the PackageID, this will facilitate the search. This parameter is used search for both packages and applications. This is a wildcard search. The parameter is Mandatory. This parameter is set to DefaultParameterSetName. If PackageID is specified, this parameter is not needed. Example: If you have an application named "Test123" and a package named "Test122", and you search for "Test", both of them will be found. This parameter should only be used if you are sure of what content you want to have removed from all the distribution points / the distribution point group. This parameter is used to specify the site code. The side code is easyest found inside the Configuration Manager console, or the cmdlet "Get-CMSite". The parameter is Mandatory. 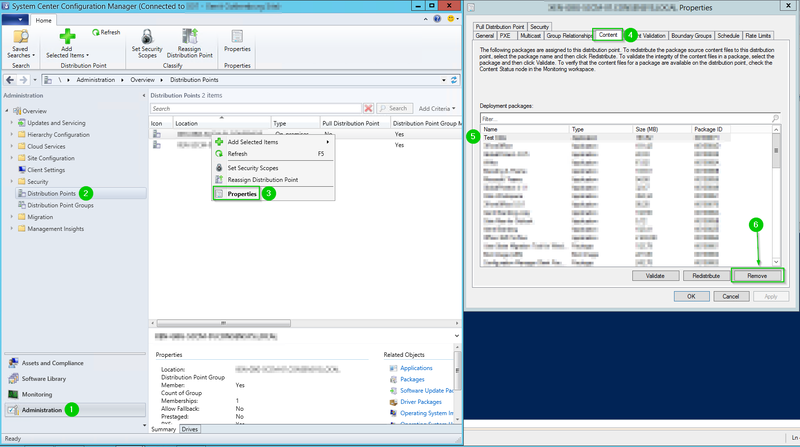 If Distribution is Application - Using Name because SQLMessage = SQL Server Conversion failed when converting the nvarchar value PackageID (example X0100001) to data type int. ## Set the current location to be the site code. Write-Warning "Failure to import SCCM Cmdlets." Write-Output "No distribution point groups were found"
Write-Warning "Unable to find Application or Package with name $PackageName"
Write-Output "Invalid Package - Going to next app"
Write-Output "Could not find any distributed content with the name $PackageName - Exiting this script"
$ObjectNumber = Read-Host "Found one application matching the name $PackageName - Please select the Object Number to continue"
$ObjectNumber = Read-Host "Found more than one application matching the name $PackageName - Please select the Object Number you want to remove"
$ObjectNumber = Read-Host "Found the application matching the name $PackageName - Please select the Object Number you want to remove"
Write-Output "Found distributed content with the name $($CMApp.LocalizedDisplayName)"
Write-Output "Removing the following distributions: "$($CMApp.Name)""
$Confirm = Read-Host "Is this correct? Y/N"
Write-Output "Confirmed. 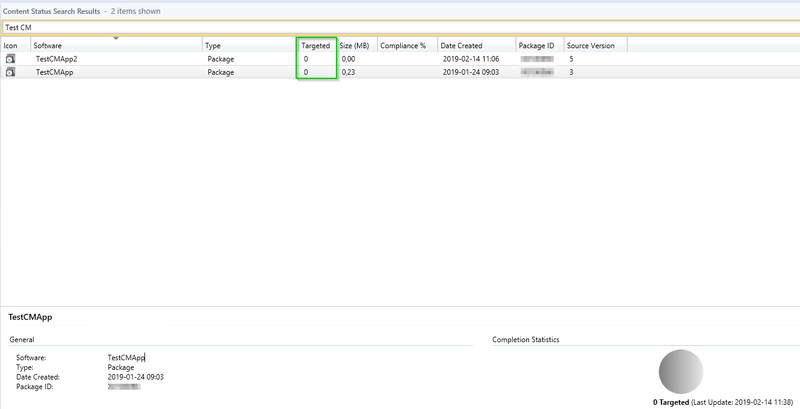 Removing distributed content from each Distribution Point"
## If Distribution is Application - Using Name because SQLMessage = SQL Server Conversion failed when converting the nvarchar value PackageID (example X0100001) to data type int. Write-Output "Trying to remove $($Object.Name) from DistributionPointGroup - Application"
Write-Output "Unable to remove $($Object.Name) from DistributionPointGroup - Application, trying Package"
Write-Output "Unable to remove $($Object.Name) from DistributionPointGroup - Application, trying DriverPackageId"
Write-Output "Unable to remove $($Object.Name) from DistributionPointGroup - Application, trying OperatingSystemImageId"
Write-Output "Unable to remove $($Object.Name) from DistributionPointGroup - Application, trying TaskSequenceID"
Write-Output "Unable to remove $($Object.Name) from DistributionPointGroup - Application, trying BootImageId"
Write-Output "Unable to remove $($Object.Name) from DistributionPointGroup - Exiting script"
Write-Output "$($Object.PackageID) successfully removed from Distribution Point $($DistributionPoint.NetworkOSPath)"
Write-Output "Failed to remove $($Object.PackageID)from Distribution Point $($DistributionPoint.NetworkOSPath)"
Write-Output "This was incorrect. Exiting script." Write-Output "You chose to exit the script." Write-Output "Nothing was found with the name $PackageName - Exiting script"
Write-Output "Removing the following distribution: "$($CMApp[$ObjectNumber -1].Name)""
Write-Output "Removing the following distribution: "$($CMApp[$ObjectNumber -1].LocalizedDisplayName)""
Write-Output "Removing the selected distribution"
Write-Output "Removing the following distribution: "$($CMApp.Name)""
Write-Output "Removing the following distribution: "$($CMApp.LocalizedDisplayName)""
Write-Output "Confirmed. Removing distributed content from Distribution Points or Distribution Point Group"
Write-Output "Removing $($CMApp.LocalizedDisplayName) from $($DstPointGroup.Name)"
Write-Output "Failed to remove $($CMApp.PackageID)from Distribution Point $($DstPointGroup.Name)"
Write-Output "Removing $($CMApp.PackageID) from $($DstPointGroup.Name)"
Write-Output "Removing $($CMApp[$ObjectNumber -1].LocalizedDisplayName) from $($DstPointGroup.Name)"
Write-Output "Failed to remove $($CMApp[$ObjectNumber -1].PackageID) from Distribution Point $($DstPointGroup.Name)"
Write-Output "Removing $($CMApp[$ObjectNumber -1].PackageID) from $($DstPointGroup.Name)"
Write-Output "Failed to remove $($CMApp[$ObjectNumber -1].PackageID)from Distribution Point $($DstPointGroup.Name)"
Write-Output "Unable to remove $($CMApp.LocalizedDisplayName) from Distribution Point Group, trying each Distribution Point"
Write-Output "Unable to remove $($CMApp[$ObjectNumber -1].LocalizedDisplayName) from Distribution Point Group, trying each Distribution Point"
Write-Output "$($CMApp.PackageID) successfully removed from Distribution Point $($DistributionPoint.NetworkOSPath)"
Write-Output "Failed to remove $($CMApp.PackageID)from Distribution Point $($DistributionPoint.NetworkOSPath)"
Write-Output "Removing $($CMApp[$ObjectNumber -1].LocalizedDisplayName) from $($DistributionPoint.Name)"
Write-Output "Failed to remove $($CMApp[$ObjectNumber -1].Name)from Distribution Point $($DistributionPoint.Name)"
Write-Output "Removing $($CMApp[$ObjectNumber -1].PackageID) from $($DistributionPoint.Name)"
Write-Output "Failed to remove $($CMApp[$ObjectNumber -1].PackageID)from Distribution Point $($DistributionPoint.Name)"
Write-Output "Removing $($CMApp[$ObjectNumber -1].PackageID) from $($DistributionPoint.Name.Name)"
Write-Output "Failed to remove $($CMApp[$ObjectNumber -1].PackageID) from Distribution Point $($DistributionPoint.Name.Name)"
Write-Output "Failed to remove $($CMApp[$ObjectNumber -1].PackageID) from Distribution Point $($DistributionPoint.Name)"
# Write-Output "Removing $($CMApp[$ObjectNumber -1].LocalizedDisplayName) from $($distributionpoint.NetworkOSPath)"
# Write-Output "Removing $($CMApp.LocalizedDisplayName) from $($distributionpoint.NetworkOSPath)"
#Write-Output "Removing $($CMApp[$ObjectNumber -1].LocalizedDisplayName) from $($distributionpoint.NetworkOSPath)"
Write-Output "Unable to remove $($CMApp[$ObjectNumber -1].LocalizedDisplayName) - $($Error.CategoryInfo) - $($Error.InvocationInfo.Line)"
Write-Output "Removing $($CMApp.LocalizedDisplayName) from $($DistributionPointGroup.Name)"
Write-Output "Failed to remove $($CMApp.LocalizedDisplayName) from Distribution Point $($DstPointGroup.Name)"
Write-Output "Removing $($CMApp[$ObjectNumber -1].LocalizedDisplayName) from $($DistributionPointGroup.Name)"
Write-Output "Failed to remove $($CMApp[$ObjectNumber -1].LocalizedDisplayName) from Distribution Point $($DistributionPointGroup.Name)"
Write-Output "Removing $($CMApp[$ObjectNumber -1].PackageID) from $($DistributionPointGroup.Name)"
Write-Output "Failed to remove $($CMApp[$ObjectNumber -1].PackageID) from Distribution Point $($DistributionPointGroup.Name)"
Write-Output "Failed to remove $($CMApp.PackageID)from Distribution Point $($DistributionPointGroup.Name)"
Write-Output "Removing $($CMApp.PackageID) from $($DistributionPointGroup.Name)"
Write-Output "Failed to remove $($CMApp[$ObjectNumber -1].PackageID)from Distribution Point $($DistributionPointGroup.Name)"
Write-Output "Removing $($CMApp.LocalizedDisplayName) from $($DistributionPoint.NetworkOSPath -replace '\\','')"
Write-Output "Failed to remove $($CMApp.PackageID) from Distribution Point $($DistributionPoint.NetworkOSPath -replace '\\','')"
Write-Output "Removing $($CMApp.PackageID) from $($DistributionPoint.NetworkOSPath -replace '\\','')"
Write-Output "Removing $($CMApp[$ObjectNumber -1].LocalizedDisplayName) from $($DistributionPoint.NetworkOSPath -replace '\\','')"
Write-Output "Failed to remove $($CMApp[$ObjectNumber -1].PackageID) from Distribution Point $($DistributionPoint.NetworkOSPath -replace '\\','')"
Write-Output "Removing $($CMApp[$ObjectNumber -1].PackageID) from $($DistributionPoint.NetworkOSPath -replace '\\','')"
Write-Output "Unable to remove $($CMApp[$ObjectNumber -1].Name) from Distribution Point(s)"
Write-Output "Unable to remove $($CMApp[$ObjectNumber -1].LocalizedDisplayName) from Distribution Point(s)"
Write-Output "Unable to remove $($CMApp[$ObjectNumber -1].Name) - $($Error.CategoryInfo) - $($Error.InvocationInfo.Line)"
Write-Output "No distribution was found with $($CMApp.Name)"
Write-Output "Invalid PackageID - Exiting script"
Write-Output "Found distributed content with the name $($CMApp.Name) - This distribution will be removed"
Write-Output "Failed to remove $($CMApp.PackageID) from Distribution Point $($DstPointGroup.Name)"
Write-Output "Unable to remove $($CMApp[$ObjectNumber -1].Name) from Distribution Point Group"
Write-Output "Unable to remove $($CMApp[$ObjectNumber -1].LocalizedDisplayName) from Distribution Point Group"
Write-Output "Removing $($CMApp.LocalizedDisplayName) from $($DistributionPoint.Name)"
Write-Output "Failed to remove $($CMApp.PackageID)from Distribution Point $($DistributionPoint.Name)"
Write-Output "Removing $($CMApp.PackageID) from $($DistributionPoint.Name)"
Write-Output "Finished - Exiting script"
This can of course be modified with more choices in every step, but at the moment I did not see the need for it. If anyone have any questions or just want to discuss their point of view regarding this post, I would be more than happy to have a dialogue. Please email me at johan.nilsson@xenit.se or comment below. Microsoft Graph is a very powerful tool to query organization data, and it’s also really easy to do using Graph explorer but it’s not built for automation. While the concept I’m presenting in this blogpost isn’t something entirely new, I believe my take on it is more elegant and efficient than what I’ve seen other people use. So, what am I bringing to the table? Zero dependancies to Azure modules, .net Core & Linux compatibility! Sounds great, but what do I need to do in order to query the Graph API? First things first, create a Azure AD application, register a service principal and delegate Microsoft Graph/Graph API permissions. Plenty of people has done this, so I won’t provide an in-depth guide. Instead we’re going to walk through how to use the functions line-by-line. When we have an Azure AD Application we need to build a credential object using the service principal appid and secret. Then we aquire a token, here we require a tenantID in order to let Azure know the context of the authorization token request. Once a token is aquired, we are ready to call the Graph API. So let’s list all users in the organization. In the response, we see a value property which contains the first 100 users in the organization. At this point some of you might ask, why only 100? Well that’s the default limit on graph queries, but this can be expanded by using a $top filter on the uri which allows you to query up to 999 users at the same time. The cool thing with my function is that it detects if your query doesn’t return all the data (has a follow link) and gives a warning in the console. PS C:\> $Users = Invoke-MSGraphQuery -URI 'https://graph.microsoft.com/v1.0/users' -token $token WARNING: Query contains more data, use recursive to get all! WARNING: Query contains more data, use recursive to get all! So, we just add $top=999 and use the recursive parameter to get them all! What if I want to get $top=1 (wat?) users, but recursive? Surely my token will expire after 15 minutes of querying? Well, yes. That’s why we can pass a tokenrefresh and credentials right into the function and never worry about tokens expiring! What if I want to delete a user? That works as well. Simply change the method (Default = GET) to DELETE and go! Deleting users is fun and all, but how do we create a user? Define the user details in the body and use the POST method. What about json-batching, and why is that important? Json-batching is basically up to 20 unique queries in a single call. Many organizations have thousands of users, if not hundreds of thousands of users, and that adds up since much of the queries need to be run against individual users. And that takes time. Executing jobs with json-batching that used to take 1 hour now takes about 3 minutes to run. 8 hours long jobs now takes about 24 minutes. If you’re not already sold on json-batching then I have no idea why you’re still reading this post. This can be used statically by creating a body with embedded queries, or as in the example below, dynamically. We have all users flat in a $users variable. Then we determine how many times we need to run the loop and build a $body json object with 20 requests in a single query, then we run the query using the $batch operation and POST method and put them into a $responses array and tada! We’ve made the querying of Graph 20x more efficient. Sounds cool, what more can I do? Almost anything related to the Office 365 suite. Check out the technical resources and documentation for more information. Microsoft is constantly updating and expanding the api functionality. Scroll down for the functions, should work on Powershell 4 and up! Write-Warning "Query contains more data, use recursive to get all!"